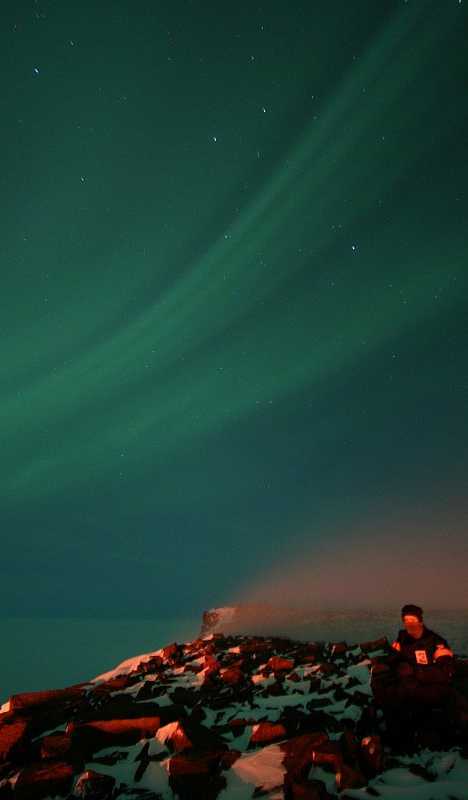 South Africa’s SANAE IV Research Base was built in 1997 in a most spectacular location: atop the Vesleskarvet plateau near the edge of 250m (820ft) tall cliffs approximately 80km (50 miles) inland from the coast of Queen Maud Land. SANAE IV pioneered and proved the “built on stilts” method of antarctic construction – the previous three SANAE stations were all subsumed and crushed by drifting snow. 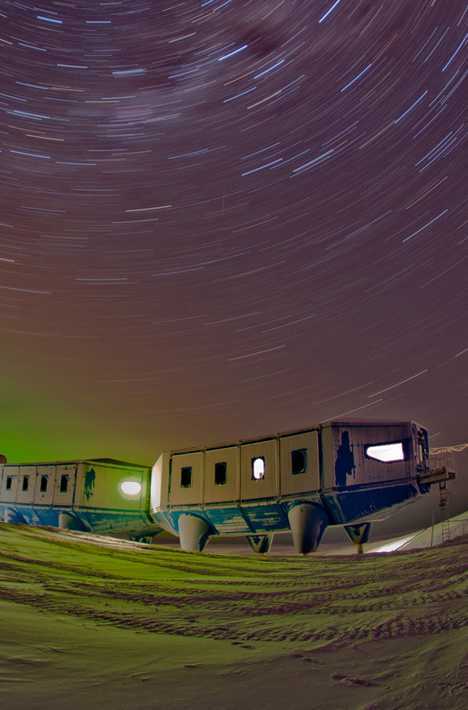 As cool as the SANAE IV research station looks, the view FROM the base is even better… especially on a clear starry night with the southern lights blazing across the sky! Kudos to AntarcticDoctor for the spectacular image above. 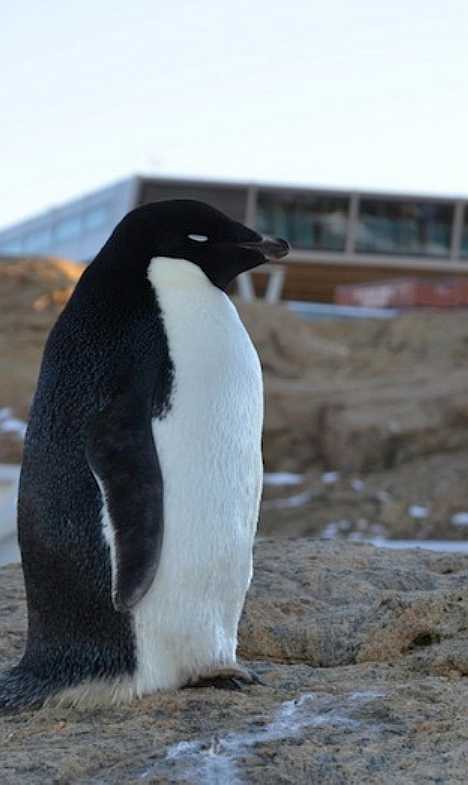 Opened in 2008, the main building of America’s Amundsen-Scott South Pole Station is the latest addition to the base established at the South Pole in 1956. Well, not exactly “at” the pole… the immense ice sheet overlying the geographic south pole flows at about 30 feet per year which will bring the station directly over the pole in about ten years. Unlike previous station buildings that have been buried by accumulating snow, the 7,400 sq/m (80,000 sq ft) new station building at Amundsen-Scott is aerodynamically designed to direct wind beneath the structure, effectively scouring away loose snow. 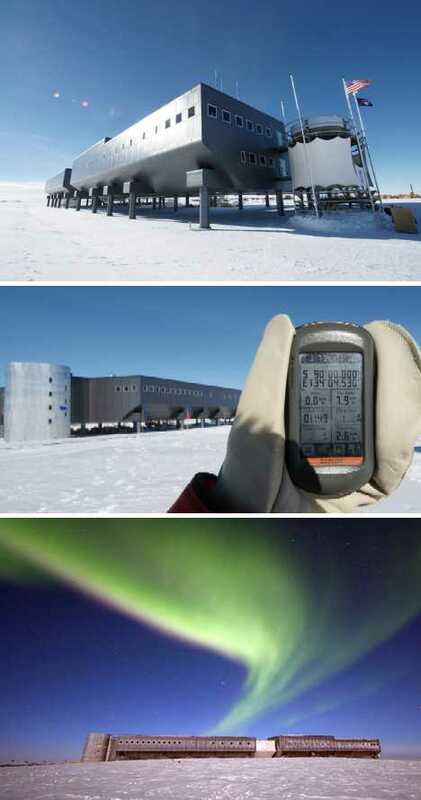 The 2,500 sq m (27,000 sq ft) Bharathi Antarctic Research Station located in northeast Antarctica’s Larsmann Hills opened in March of 2012 and is India’s third antarctic science station, though only two are currently active. The station was constructed from modified shipping containers, greatly simplifying the necessary chore of environmental remediation while making the best use of a limited budget. The natives were undoubtedly happy to hear that. 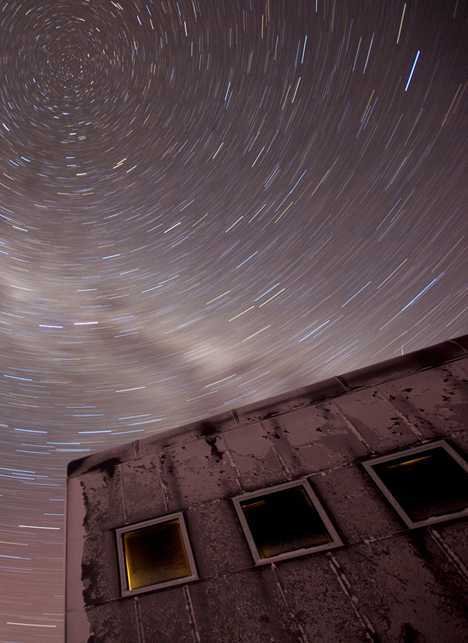 The UK’s Halley Research Station was founded in 1956 and is currently in its sixth iteration, all of the previous bases having been crushed and buried by drifting snow. With each new station, improved construction designs were implemented in an ongoing effort to keep ahead of the snow. The stilted Haley V base succeeded where previous bases foundered but had to be abandoned anyway, as its location on the moving Brunt Ice Shelf took it too close to the edge of the calving ice sheet. Halley VI is also stilted but the modular station is mounted on supports that end in wide flat skis. Obviously it’s easier (and cheaper) to move your research base than to build a brand new one.